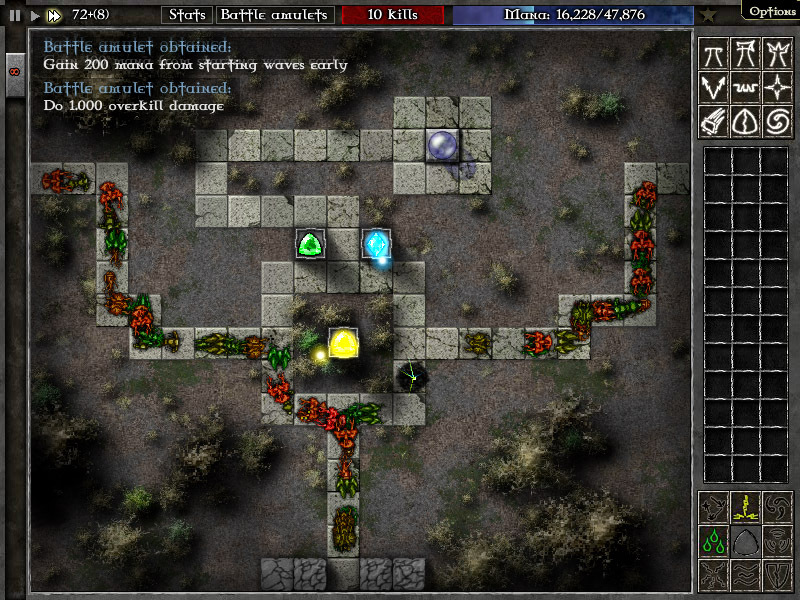 GemCraft Labyrinth is a “Tower Defence” game, similar to the multiple Zombie Tower Defence games available. Bugs travel along maze tracks, trying to get to and destroy your Orb on each level. To protect your orb, you create magic gems and place them in towers or traps to kill the bug. Towers have a longer range, while traps give more power to the gem’s special abilities. You can also drop the gems on bugs as bombs, but this is so ineffective it isn’t worth bothering with. Bugs can also be killed by shrines, but these also are pitifully ineffective. Pretty much the only reason to use the shrines is to get the bonus for having killed, 20, 60 &120 bugs with shrines. 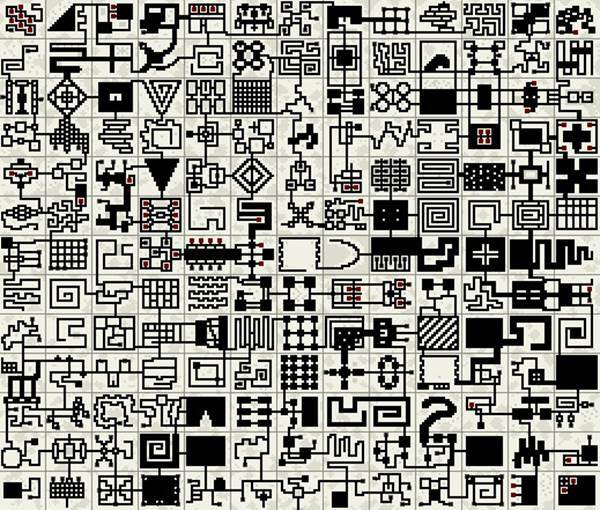 As you complete each individual maze, more mazes open up in the overall labyrinth. Chain Hit Gem (Lime): Has a percentage chance of hitting multiple targets, if they’re close enough together. Multiple Damage Gem (Yellow): Has a percentage chance of causing twice (or more) damage. Mana Gathering Gem (Orange): Gathers additional Mana on every hit, not just when the bugs are killed. Poison Gem (Green): Causes additional poison damage over time. Poison ignores the armor rating of the bugs. Bloodhound Gem (Red): Causes a higher amount of damage with each bug killed. Shocking Gem (Cyan): Temporarily stuns the bugs. Slowing Gem (Blue): Temporarily slows the speed the bugs move through the mazes. Armor Tearing Gem (Purple): Permanently reduces the armor level of bugs and structures. You can combine up to three gem types. For Endurance games (1,137 levels) the best combo seems to be Chain / Multiple / Mana. This does enough damage to multiple targets, and provides you with enough mana to upgrade your gems enough to continue as the levels get harder. You can play the same mazes over and over, to earn more experience points, and/or to try to play them with harder settings, such as more bugs, stronger bugs, more heavily armoured bugs, etc. 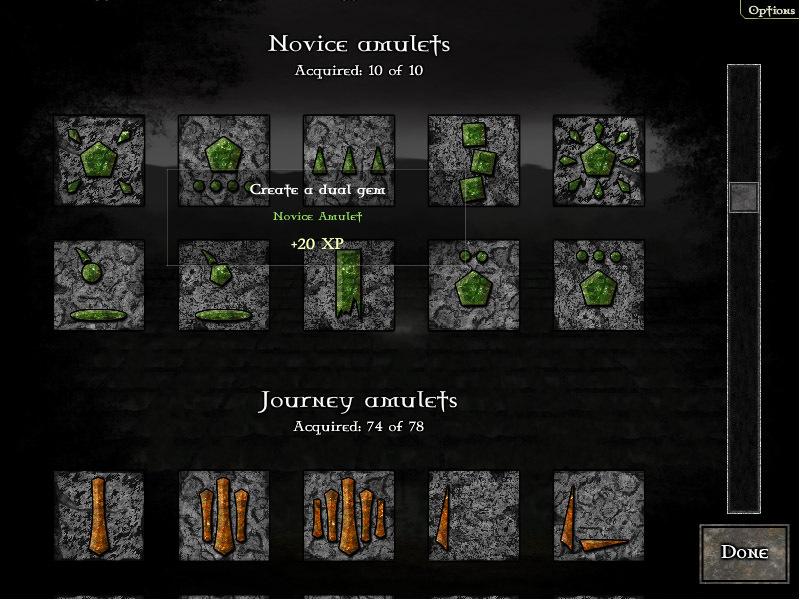 In addition to bonus multipliers for each level, there’s a host of side “amulet” achievements for the game, giving you incentive to try all of the game features, such as using gems as bombs on bugs and structures. 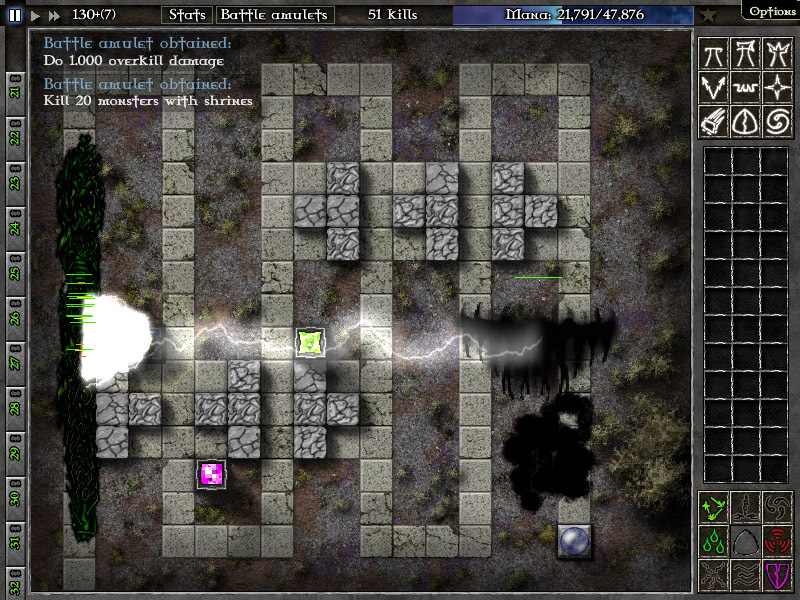 If you like tower defense games, this can provide quite a few hours of amusement. If you’re the type to want to solve every maze on the highest possible setting, expect it to take a couple years, unless you have absolutely nothing else to do, in which case it should only take several months.